one of my current goals for my databending/glitch art work is to eventually do a show of all databent stuff at a local gallery. participating in a smaller group show, maybe something like the visual fringe at this year's indy fringe festival, might be a good step toward that. but transferring a digital artform to a more traditional venue like a gallery... therein lies a problem. of course i could still blow them up huge even though it's not recommended. because these are databent works, rather than normal photographs, the increased graininess of the prints might not detract too much from the works. (indeed, for some works, the graininess could even make the pictures look better.) i bought a databent poster from cafepress a couple years back, and it doesn't look too bad. but if we're talking about a serious art show where i expect people to pay real money for my work, the "not too bad" standard is too low. and at $20 a pop, i can't afford to just buy tons of prints and see which ones turn out okay. the obvious solution is to simply create larger databent works, but that creates surprising new challenges. recently i stumbled across a flickr photographer from amsterdam named peter klashorst. he has lots of creative commons–licensed nudes in his photostream (so you need to turn off safesearch to see a lot of it), and he has a multi-micropixel camera that takes enormous, crisp photos. so his stuff was a natural choice for my latest bending experiments. but the huge size of my base image has had some surprising effects. for one thing, photoshop crashes whenever i try to resave the base image as a PNG. the calculations are just too big and my computer chokes. i'm sure it could be done with better hardware (maybe on my laptop), or on this hardware with more-efficient software, but for the time being i simply can't do it. so no poster-sized PNG bends. for another thing, and this was really surprising, when i open these files in sound forge and then save them again, the data gets corrupted. so without me making any real changes, the image goes from this (not work safe) to something like this (same disclaimer). and what's really weird is that if i save again, the data gets uncorrupted! then if i save yet another time, it's corrupted again, and so on. perhaps this behavior should trouble me, but it's so fascinating that i can't leave it alone... and it's produced some very nice bends. the image posted above, for example, was created by running sound forge's "acoustic mirror" effect on the corrupted version of a photoshop RAW file based on this image (which was itself a glitched jpeg version of the klashorst original). running the same effect on the uncorrupted data yielded far different, and far less interesting, results. but then, once the bending is done, we run into yet another problem with bending big image: flickr has a maximum image size of 10mb (for pro users). 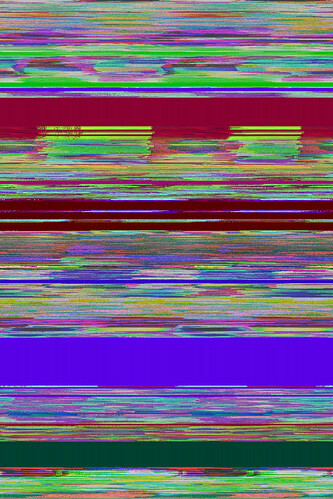 and while the klashorst originals were under that size, a really glitched-out image with the same dimensions takes up a lot more disk space... closer to 30mb. this is because jpeg compression is optimized for the kinds of color patterns that occur in normal photographs, not the noisy chaotic colors of an image that has been databent beyond all recognition. Who says 8x10 isn't big enough for the art world? I've seen plenty of prints that I would buy that were only 8x10. 11x14 is also a good size. These sizes are also a lot easier and cheaper to frame. I'm curious to see how these images would translate to print. flickr doesn't have an 11x14 option. that's part of the problem: it skips from 8x10 (which just feels too small) to 20x30 (which is on the verge of being too large). of course i can get the prints done elsewhere, but that just slows things down.